Jamie Stunt visits with a yak at Rosemary’s farm. Photography by Luther Caverly. This article appeared in the Interiors edition of Ottawa Magazine in February 2013. YAK TATAKI. Yak tataki. When I first spotted those two words on the menu at Oz Kafe four years ago, I couldn’t wait to say them out loud: yak tataki, yak tataki, yak tataki. They are the kinds of words that a food writer dreams about — playful, whimsical, and deliciously unusual. They make you laugh, perhaps salivate, and dream. In a job that constantly battles against boring, repetitive, predictable menus and the constraints of the English language (how many ways can we talk about a great steak? ), this dish was already infused with the makings of a great story, and I was determined to find it. I mean, who has the nerve to serve yak in Ottawa? And how in the world did the chef get his hands on fresh yak meat? I would soon discover that a herd of Tibetan yaks was roaming the wilds of the Ottawa Valley. When the plate arrived, the meat was just barely seared, thinly sliced, and topped with anchovy mayo and bacon breadcrumbs. It was not the kind of dish I had expected to find in a meat-and-potatoes government town, but there it was — all crimson and succulent and drenched with soul-satisfying umami. The dish had been prepared by Jamie Stunt, the creative young chef I had pegged a few years earlier as one of the city’s culinary up-and-comers. The restaurant where Stunt cooks is the late-night crash pad for fellow cooks, who swing by after their shifts to fuel up on smoked duck poutine and spicy grilled beef lettuce wraps. 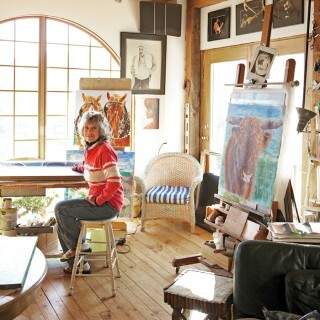 Rosemary Kralik paints at the farm. Photography by Luther Caverly. When I interviewed Stunt for the profile I was writing, he told me how he sank all his energy into cooking after losing his brother in an accident. Working in kitchens, he quietly gained a reputation as a risk taker. Some called it culinary bravado when he served yak heart tartare and yak head chili at an underground supper club (he has also begun offering yak heart and yak liver cabbage rolls at Oz Kafe). But those who knew him understood that it was Stunt’s attempt to show respect to the beast by using every last bit of it. Last November, it was another plate of yak that catapulted Stunt into the culinary limelight when he won the Gold Medal Plates Ottawa competition. He wowed the panel of judges with pan-seared yak tenderloin and seduced them not only with the exceptionally tasty dish but also with the story of an unlikely pairing of hipster chef and hippie farmer. Stunt will now go on to the Canadian Culinary Championships in Kelowna in February, competing against the gold medal winners from nine other cities from Vancouver to St. John’s. Stunt began putting yak on his menu after meeting farmer Rosemary Kralik at a weekend farmers’ market. Kralik came to raise the long-haired bovines after a series of events over the years led her to her current farm. She was still in high school when she became disillusioned with the industrial food system, swore off supermarket food, and sought out farmers who raised animals the way she believed animals should be treated. But it was decades before Kralik would become a farmer herself. In 1993, a dear friend who was on his deathbed said these words to her: “God will not come from the sky to give you what you want. No one cares what is in your heart; only you can know and care enough to pursue your dream.” Those words inspired Kralik to pursue the dream of farming. Stunt experienced an instant kinship with the farmer and felt good about serving her yak in the restaurant, even knowing it might have limited appeal with customers. He shared Kralik’s conviction that we can actually taste the happiness of the animals we consume and that we receive health benefits from those that have enjoyed good health and a stress-free life. Kralik cites studies with evidence that yak meat is very high in CLA (conjugated linoleic acids) and omega-3, both of which have been shown to reduce the risk of cancer. She is also convinced that the meat from happy animals tastes sweeter and is more satisfying. This all meshed with her belief that what we eat directly affects us. For her, there is no doubt that cruel farming and butchering practices are linked to widespread human depression in the world. Most of the animals we consume, she says, have known nothing but misery. It’s not surprising, then, that her yaks play in the sun and wander out to the woods of the 722-acre farm to feed on buds, leaves, and bark. In the spring, she uses a rake to help detangle their winter coats as they shed. When Kralik talks about her frolicking yaks, she could just as well be describing a charming but unruly band of backpackers who have opted to crash in her barn for the weekend. She loves to tell the story about the time she received an unexpected call from the provincial police. A dozen of her yaks, calves and all, had escaped from the farm and had turned up at a golf course, located about 50 minutes away. “I didn’t even know they played,” she quips. When the story hit the local papers, people were outside in their bathrobes with cameras trying to spot them. In the end, it took a month to round them up — all part of the adventure of raising the uncommon beasts (there are only about 2,000 yaks in North America). Looking back at it now, Kralik says she couldn’t help wondering if they were just trying to find their way back to Tibet. As a food writer, I was drawn to the yak story on many levels. Similar to bison and other heritage-breed animals that are gaining popularity among health-conscious carnivores, yak meat is lean, protein-packed, and low in cholesterol. It is also delicious and revered for its delicate, sweet, beef-like flavour. The problem comes in the cooking. Because it is extra, extra lean, yak easily turns as tough as shoe leather — and about as tasty. The best way to eat it is raw or nearly so, like steak tartare or the way I was introduced to it at Oz Kafe: yak tataki. Soon after that first bite, I felt compelled to track down and find out more about the woman whom I referred to affectionately as The Yak Lady. During a series of phone conversations, I learned that Rosemary Kralik is also an artist — a painter — with a surprising background as a management consultant for the federal government. But she gave up the great salary, security, and pension (a decision people thought was crazy). She’s one of those brave souls who follows through on a dream to change direction entirely. In Kralik’s case, she opted for a life of combing yaks with a rake. Kralik’s description of her initiation into farming life did not inspire great confidence. She recalled standing and watching a parade of animals — horses, pigs, sheep, and goats — at a sale barn near Fitzroy Harbour. Then the auctioneer led out a pair of shaggy black Tibetan yaks with handlebar horns and humped backs, and she noticed how the crowd instantly dispersed as people wandered off to the canteen for a coffee. She, however, was lovestruck. They were the most beautiful creatures she had ever seen. In just over a decade, that cow and bull (the names for the female and male yaks) have given her a herd of 28. I wondered whether Kralik actually eats these animals after nurturing them at a level many people reserve for their pets. “The only reason I’m raising them is to eat the meat,” she says in response to that question. “But you have to love and respect them. The animal is giving you its life so that you can live.” It’s a contract she takes extremely seriously. On the day each yak is born, Kralik promises it a good life. When the time comes for one to be “put away,” she stays with it to the end. “I look into his eyes, I stroke him, I thank him,” she says. “They understand the vibes. They go quietly and calmly, and that makes a world of difference.” In fact, there is only one certified butcher in the Valley whom she trusts to give her animals a dignified death. She swears she’ll sell the farm once that abattoir goes out of business. “There is no point in doing what I do on the farm if the animal is going to die in terror,” she says. Meanwhile, she has yet to figure out a way to make the farm financially viable — and doesn’t know if she ever will (she continues to paint portraits to pay the bills). The hay alone costs more than $17,000 a year. And since yaks are slow to mature, she had to care for them for many years before there was a herd of 28 and any meat to sell. When we first met in 2008, she had just begun renting a stall at the Ottawa Farmers’ Market with a freezer full of ground yak, yak sausages, and yak salami. I wanted a chance to chat when she was “off duty,” so we arranged to meet for coffee one afternoon when she was coming to town to deliver meat. During the conversation, it quickly became clear that not only was she a yak whisperer but that her everyday wisdom came from a life lived largely on the periphery and in solitude. “I am a hermit,” she declared. “ What I love about farming is that you get up every day and deal with what you see in front of you. There are no excuses — you do it or something dies.” We spent the next hour jumping from topic to topic — from food to art to mortality to parenting. I learned that as a student, Kralik had studied ballet, music, and theatre but was drawn to physics, chemistry, botany, and zoology. Her talent as an artist, nurtured during a childhood spent in Egypt and, later, in England, came in handy in Canada (she arrived here in 1959), when she began working for a design company in the late ’60s. By the time she was 18, Kralik had been invited to exhibit her artwork professionally, her scientific illustrations had been published in government reports, and her studies of people and animals had won prizes in high school competitions. She later pursued her passion for architecture (her then husband was an architect), learning architectural drafting on the job. After that, she took university courses on computer programming, statistics, and psychology — a combination of skills and experiences that ultimately led to consulting work for several federal departments, including Health and Welfare, Agriculture Canada, and Indian and Northern Affairs. Her federal career proved to be both intense and lucrative, her skills as a number cruncher and innovative problem solver proving to be a crucial apprenticeship for her next career — running a farm. The farm has provided Kralik with the opportunity to elevate agriculture to a work of art. Now, at the age of 68, she declares it her magnum opus. The more I listened, the more I began to understand the real story behind the yaks, the freedom they have to live their lives the way they want. I sensed that this was a theme she felt echoing in her own life and told her so. She smiled at me knowingly, the way a teacher looks into the eyes of a student who has suddenly understood the meaning of Descartes’ Discourse on the Method. Suddenly I was having another epiphany about that dish of yak tataki. I could now see that behind every delicious mouthful, there was bound to be tragedy and trauma tucked away inside the person who was motivated enough to transform it into something beautiful. It was time to go, and Kralik reached out for a hug before getting into her backward-facing truck. “Nothing is all good or all bad,” she said in farewell. “Everything has both sides. If you don’t realize this, you miss out on half of life.” And with that, The Yak Lady wheeled around and drove away. Shawna Wagman gratefully acknowledges the financial support of the City of Ottawa.